As with any goal, to give yourself the best chance at success, it’s important to be realistic. If you’ve never run a mile consecutively without stopping to walk, don’t sign up for a marathon next month. If a marathon is your end goal, assess where you are currently and make a plan for how to get there in a reasonable amount of time. By pushing yourself too hard, too fast you’re not only setting yourself up for failure but also increasing your risk of injury. When it comes to goal setting, you’ve probably heard the acronym S.M.A.R.T. which stands for specific, measurable, achievable, relevant and timely. By paying the registration fee and putting a race on your calendar, you are making a commitment and are more likely to take your training seriously. To find races in your area, check out Active.com. Depending on your experience level and the distance that you are planning to run, set a training schedule and stick to it. The ideal training schedule should also be based on the type of race you plan to run. Is it a road race, a track race or trail race? Thankfully, since we live in the age of the Internet, you don’t have to come up with a plan from scratch. There are countless training schedules readily available that you can tweak to fit your individual needs and lifestyle. Some great resources are Hal Higdon or Runner’s World. One of the biggest mistakes you can make for your first race is to wear new shoes. Invest in properly fitting running shoes to wear as you train and that will last through your race so that they are well broken in but not overworn. While off-the-shelf sneakers may be good for casually running errands on the weekend, you should consider custom-fitted running shoes. Marathon Sports in Norwell, Massachusetts offers free visual gait analysis to make recommendations about what may work best for you. If you’re up for a drive, Fleet Feet in Longmeadow uses 3-D foot scanning technology to capture 12 data points such as length, width and arch height. They will also evaluate your stance, stride and step to identify the best shoes, insoles and socks for your feet, as well as the best way to lace them. As you train, use it as an opportunity to find what clothing will work best for you on race day. Avoid cotton fabrics at all costs and look for moisture-wicking materials such as DryFit or Thinsulate. If your running in the summer or a hot climate, materials such as polyester or CoolMax can help. For the winter, SmartWool or Thermax are ideal. Running socks can help prevent blisters; Fitted, but not restrictive running shorts or leggings can help prevent chafing; and for women, a supportive sports bra can make all the difference. Though not necessary, you may also consider a running watch to track your overall time, pace and route, and a running belt to carry your ID, phone or some form of personal protection if you plan to train alone. If your clothing is not rated for UV-protection, don’t forget to wear a broad-spectrum (UVA and UVB) waterproof sunscreen of at least SPF 30. If possible, it’s a good idea to run the race route before the actual race day. This will help you learn what areas you’ll need to push and where you can cruise. It’s also a good way to adapt your training schedule. Do you need to train on more hills or change up your running surface? In addition to running, it’s a good idea to mix in other types of activity into your training schedule. Low-impact workouts such as spinning, swimming or yoga are particularly beneficial since running puts a lot of stress on your knees and ankles. Incorporating variety when you train for your first race can help improve your overall endurance, reduce your risk of injury and have positive impacts on how you feel after you cross the finish line. When you train for your first race, it’s important to schedule the time to rest. An ideal training schedule will include a medium run, a cross-training day, one or two easy days, a tempo run, a speed workout and one or two rest days. As great as schedules are, listening to your body is more important. If your body is showing signs that you need to rest on a day that isn’t your scheduled rest day, don’t ignore it. This will vary greatly depending on the intensity of your run, both speed and incline, as well as your individual body mass, but the average runner will burn 300-400 calories during a 5K (3.1 miles) or 2,300 to 3,000 calories during a marathon (26.1 miles). If you’re not trying to lose weight, it’s important to balance the calories that you take in with the calories that go out. This will give your body the fuel that it needs to perform its best. As a runner, it’s not only about how much you eat but what you eat and at what times you eat it. Bananas are a great high-carb energy booster for before or after your run. Oats not only provide plenty of carbs, but they are also high in fiber and have a low glycemic index which helps give you energy over a longer period of time and stay fuller longer. Whole grain pasta, peanut butter, broccoli and potatoes are other great choices for runners. Hydration is important on a daily basis, but especially when you’re training for or running a race. Water plays an important role in helping the body regulate its temperature, move waste from your body, ensure that your joints are adequately lubricated and to flush out the damaged cells that lead to inflammation. For running, you may consider a hydration pack. These come in a variety of wearable styles including backpacks, vests and waistbelts. 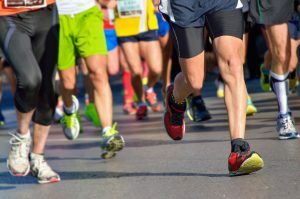 While these tips to train for your first race can help you achieve your goal and perform your best, they are also important for preventing injury. Running increases the risk of various injuries including runner’s knee, Achilles tendinitis, plantar fasciitis, stress fractures, sprains, shin splints and hamstring issues. At South Shore Orthopedics, our sports medicine specialists are here to treat you should you sustain an injury. For more information or to schedule an appointment, call (781) 337-5555.